When it comes to giving a space character, color and texture are kings. However, we seem to talk a lot more about color than we do texture–perhaps because a crimson chenille throw is a more obvious accent than a closet door’s natural wood frame. But any designer will tell you that texture is just as important as color. A truly sensual atmosphere embraces your senses with lighting and color, sound or silence, fragrance candles or an open window, and rough or smooth textures. A timeless natural material, wood can be easily manipulated to achieve many different textures to enhance many different styles. What’s more, salvaged wood has emerged as a hot design trend this year. So jump on the bandwagon and check out these 4 ways to use wood in your bedroom decor. “Chic Transformation” bedroom by Jeffers Design Group, constructed by Stingray Builders (Photo: Matthew Millman, via jeffersdesigngroup.com). 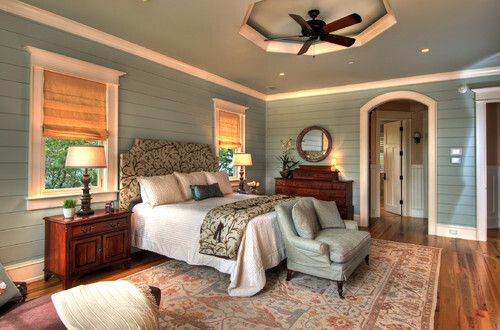 In this master bedroom, Jeffers Design Group has upended conventional design wisdom in its use of texture and color: usually one grounds the space by choosing flooring that is more textured or patterned than the walls, as well as two to three shades darker. Nevertheless, the designers have covered the wall accent wall behind the bed with reclaimed teak and the floor with a ribbed ivory carpet. Both the wood and the carpet have relatively soft textures and, in the natural light, give off a soft sheen. The teak wall pulls the eye in and causes the smaller wood accents to pop: the sideboard drawers’ front panels, the bedframe’s feet and the circular wooden stools. In this Contemporary Bedroom by San Francisco Interior Designers & Decorators Leverone Design, Inc., smooth natural wood juxtaposed with white-painted wood panels creates a calm space that feels like a seaside getaway even in the midst of this mountain home. 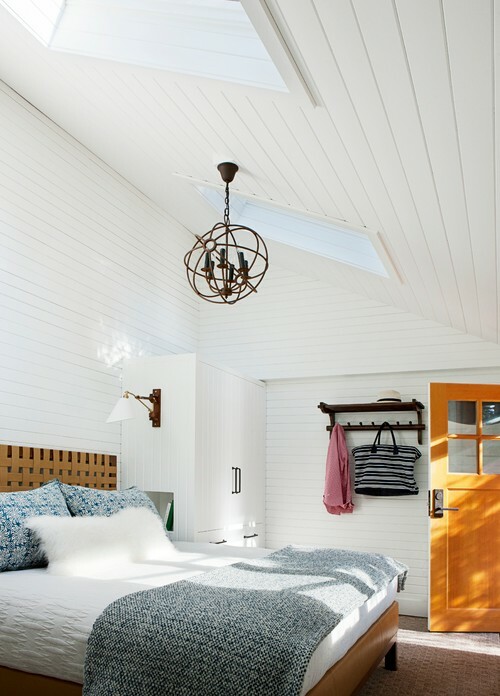 The woven headboard, wooden rack, and natural wood door give the space warmth, subtly interacting with the galvanized metal fixtures to ground the airy bedroom decor (Photo: Colin Way, via houzz.com). 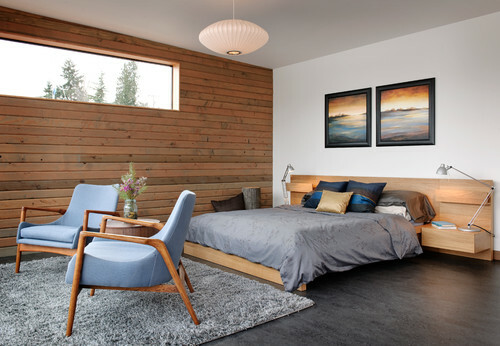 In this bedroom by Seattle General Contractors Dyna Contracting, the smooth bedframe and headboard’s uniform tone and texture contrasts sharply with the variations in the accent walls’ panels. Reminiscent of mid-century modern style, the room’s wooden furniture is very streamlined, from the wood-framed Saarinen-style chairs to the low bedframe and headboard. But the wall, with its natural knots and changing hues preserved, warms up the hard surfaces and cool tones, provides extra visual and textural interest and draws the eye to the forest outside (Photo via houzz.com). We’ll discuss how to use rough wood textures to achieve hot looks like modern pioneer and rustic chic in our next post. This entry was posted in Bedroom Decor by Bedrooms & Baths. Bookmark the permalink.